Is the S'port All Back Support right for me? 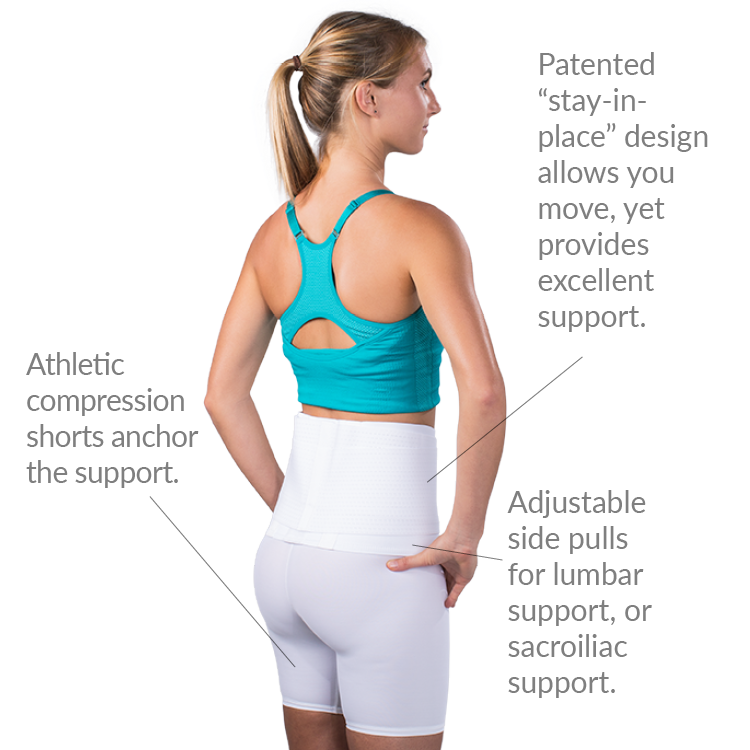 Designed to support the lower back and sacroiliac joints during vigorous activity. Try our Brace Advisor for personalized product recommendations to meet your needs! Saunders Supports are one of the only back supports that will allow vigorous activity, while fully supporting the lower back and sacroiliac joints! This is possible because the back support is attached to an athletic compression short. The S'port All is guaranteed to stay in place. Our patented design keeps it from riding up, even while playing sports, gardening or working! do you wear this over your underwear? Yes, the Saunders S'port All Back Support w/Shorts would be worn over the undergarments. Do you wear this directly on the skin or should it be placed over a tee shirt? Do the shorts detach for laundering? Has the option to purchase extra shorts become available in the last year? Both of these features seam pretty important. Are the men's version available in black? I wear pants between 38 & 40 waist depending in the style and cut. What size short should I order? I will be using this for golf and other activities. I have a 37 - 38 inch waist. What size would you suggest? Also, must shorts be worn with brace? I have a 35 inch waist. Should I get a medium or a large? I have just under a 31" waist. I will be using it for skiing. What size do I need? i have chronic sciatic nerve pain, i will be getting a XLG . i also have a knee that doesn't bend, which leaves with one leg bigger then the other. question is will the shorts ride up on me? i have a 34" waist and 39" hips. (large waist in proportion to hips). Am I right that there is no size that would fit comfortably? There is not perfect size for your measurments unfortunaly. The large is the size I would suggest, the shorts may be a little loose but the most imortant part of the brace is the support and you do not want that to be too tight. I am a 65 year old man and I have spinal stenosis in my lumbar region and enjoy playing golf so is this the back support you recommend or is there a different one? Also, to determine my correct size, where should I measure my waist? Is this slim enough to wear under dressy work clothes? can you recommend one that does? Do this brace support your lower back when running 1.5 to 3 miles? This is the only brace that we carry that will give the back support while doing activities and it is guarenteed to stay down and not ride up. To answer your question yes you can wer this and run. The brace has adjustable straps to allow as much support as you want. Does the women have a crotch opening? Can you buy extra pairs of shorts - seems limiting to have just one. My waist is 33, what is the right size for me to wear the back support w/short. I prefer comfortable not to wear very tight around my stomach. Would you recommend this brace for someone who plays football and has spondylosis? This is an elastic lumbar support that will provide support for mild to moderate back pain and is flexible enough to be worn during vigorous activity. I am an EMT and am looking to get a back brace due to chronic low back pain on either side. I was curious, since I will also be driving while using this, is it known whether it is comfortable to wear while also driving a vehicle or is it too rigid? This brace is elastic and a brace that can be worn while playing sport or doing physical activity so it is very comfortable and flexible. Wearing this while sitting should give you no problems what so ever. I would like to use this support for surfing as i feel it will hold well in the waves. Is the Velcro and material suitable for swimming/surfing? If not do you have any other products you can recommend? How do you wash it? Please be detailed because I don't understand the tag. It says to "close all hook and loop closures"? I dont know what that means!! 1) For the men's version do you need to take the entire thing off in order to pee? The men's has a fly opening. Can the back brace be used by a baseball player? Can the shorts have a cup holder for men's? This brace can be worn while playing baseball. The shorts are going to help keep the brace from migrating during activity. This brace however, does not come with a cup. If you have any further questions please don't hesitate to contact us. Thank you for your question. Do the compression shorts that are attached to the back support have a front section that will hold a protective cup for males? Unfortunately the back supports with the compression support do not offer that feature. The male version has a fly front and the female version is closed. Hello, My question is whether I can play competitive elite <a href="http://www.betterbraces.com/soccer">soccer</a> with this brace? My sacro horn sticks out on the left side, will it keep in motion? This is a 1 piece brace with spandex shorts attached to a lumbar support brace. It will not shift during running since the shorts are attached. Great option for active people. Will the Sport All stay in place while playing basketball? Yes, the Sport All should stay in place while playing basketball and other athletic activity. Does the S'PORT Max you offer come with magnetics in the back support ? No there are no magnets. I experience lower back pain while <a href="http://www.betterbraces.com/cycling-and-biking">bicycling</a>. Can the Saunders S'port back support be worn while cycling and will it help relieve this pain? Yes, you can ride it while cycling. However, we cannot say that it will for sure help relieve your pain. Every person is different. Do you where the brace under clothing next to your skin also is it very thick material, I where a 32 inch waist slack - will they fit comfortably? you do wear these under your clothes. They are about 4mm thick, so it should be just fine to wear under your slacks. very supportive especially for the lowest spinal segments L4, L5 and sacrum. I've personally used S'port all years ago and found it gives really good compression and support to my abdominals. Love it when doing yard work. Recently I ordered one for a client and she loves it as well. For nearly twenty years (off and on), the S'port All back support has been the BEST for me. Wearing the support during exercise is THE critical factor in keeping my back healthy and pain free. I LOVE the way the large velcro area on the shorts keep the add-on lumbar support from slipping up or down. One of the best features of this brace is it's stability during wear. Can't say enough good things about S'port All. It is definitely a 5 star worthy product, in my opinion and long term experience with it. I have used the Saunders S'port Max for years. It is time to reorder and I note the new model has the removal belt. If it is as good my old brace you have a winner. Question is why white only instead of black? I've used this amazing back support for years (wore it out) I ordered mine after my husband got one for horseshoeing. I worked in a feed store and always had a back ach at the end of the day. Now I've found that I have degenerative discs in my lower lumbar, hoping to extend my days without pain. Simply the best brace for stabilizing the lower back, sacrum and pelvic area during exercise. The design of the shorts and belt eliminate any upward slippage of the brace making it perfect support for golfing. Well hidden under clothes, supports the back all day long! The product is good, it gives a good support on the back and because of its attachment with the shorts, the back brace doesn't slide. The only problem is that it is a hassle to dress on the brace because of the shorts. So, if you want to use on daily basis, it`s definitely not the best one...but if you are going to use for practicing sports once in a while, then I think it is a good brace....I do like the product, and I think the product would be perfect if the brace itself was comfortable enough to be used without the shorts. I am a high school basketball. I have developed some low back issues, old pars fractures, etc. This back brace allows me to play with great support, without restricting my movements and speed.